This stylish room offers free Wi-Fi, a minibar and satellite TV. These spacious rooms have wonderful views of the sea. Some rooms feature a private balcony. Fitted with wooden floors, they offer free Wi-Fi, a minibar and satellite TV. These bright rooms have classic, elegant décor. They have free Wi-Fi, a free safe, a minibar, desk, a TV, air conditioning and heating. Some have a balcony. This room is made up of 2 interconnecting rooms, including one with sea views. There are 2 bathrooms, a desk, free Wi-Fi, a free safe and a TV. 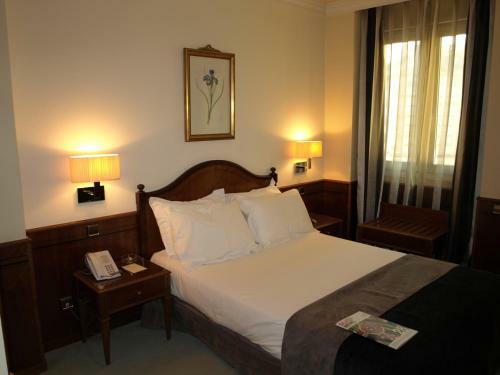 This family room consists of 2 connecting rooms, 1 with views of the Cantabrian Sea and 1 deluxe room. It has a minibar, seating area and air conditioning. This double room is smaller and has free WiFi, a flat-screen satellite TV, a minibar and a safe. The marble bathroom has a magnifying mirror, a shower, a professional hairdryer and green tea toiletries. The room has independent air conditioning and heating. Room service is available. This room has a 1.35 x 2 metres double bed. Please note, this room cannot accommodate an extra bed. Situated next to Santander’s famous Sardinero Beach, this modern hotel offers wonderful views of the Cantabrian Sea. Free Wi-Fi, a minibar and satellite TV are included in each stylish room. Silken Rio Santander is located near the city’s Gran Casino. Santander Cathedral and the ferry port are 3 km away. Regular buses to the city centre stop near the hotel. The restaurant Mare Alta serves creative modern cuisine and has sea views. The Marea Baja café-bar is open all day, offering a range of light snacks. Rooms at the Silken Rio have simple, elegant décor and dark wood furniture. They include air conditioning and a private bathroom with a hairdryer. The property is partially adapted for people with reduced mobility. There are access ramps and 2 partially adapted rooms, which have handrails in the bathroom and bath tubs. When booking more than 4 rooms, different policies and additional supplements may apply. Las habitaciones parecían más luminosas y aunque el decorado fuera tradicional está bastante anticuado.Esperaba más de un 4 estrellas. La habitación era minúscula además de hacer una calor insoportable,no había enchufes en las mesitas de noche . La gritería de la ducha estaba estropeada y era muy difícil controlar la temperatura del agua . Ik had een werkelijk schitterende kamer op de vierde verdieping met adembenemend uitzicht op El Sanderino. Het restaurant (Marea Baja), beperkt aanbod en kwaliteit niet top. Het andere restaurant (Marea Alta) was 's avonds niet geopend. Lovely rooom and location but wouldn't go back. The room was great and the bed comfy Great position looking over the beach and the bay. Beware the Casino has a disco on a Saturday night that goes on until 4pm and you can hear it in the hotel! Hotel is in need of an upgrade, outside the room the facilities were basic. The staff were not communicative enough. And on our first evening the lady in the bar was gave sloppy service, throwing the bread down after we had finished our meal. Shade of fawlty towers! Won't recommend it. I asked for a hotel with parking as all our worldly goods were in the car. No parking except on side streets, Just pot luck. El hotel está perdiendo encanto con el paso del tiempo. Una ubicación magnífica. Buena comida en el restaurante y un magnífico trato por parte de las camareras como del maitre,siempre atentos a las necesidades del cliente. Mi mujer es celíaca y nunca hemos tenido ningún problema con la comida. Hemos estado en este hotel bastantes veces. En recepción no son muy simpáticos. El resto del personal es muy atento. Le sobra una estrella. No está cuidado. Podría mejorarse la amabilidad en la recepción. Pasamos mucho calor y la habitación un poco pequeña. La ubicación es perfecta y el precio por noche muy bueno pero el desayuno carísimo, no lo contraté. 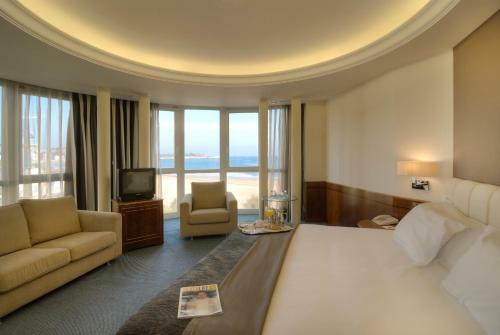 Overlooking Sardinero beach, this upscale hotel with a tower and a glass facade is a 2-minute walk from the Gran Casino del Sardinero and 1.5 km from the zoo and beaches on the Magdalena Peninsula. Classically furnished rooms with wood furniture feature satellite TV, free Wi-Fi and minibars. Upgraded rooms add balconies and sea views. Family rooms include sitting areas with sofas. Room service is available. Amenities include an elegant restaurant with sea views, as well as a relaxed cafe-bar with a flat-screen TV. A business center and event space, plus 6 meeting rooms are also available. A shuttle service is offered for a fee, as is parking.